We take for granted the incredible accuracy of our maps today -- but for Helen and Theseus, and their fellow bronze age heroes, the shape of the world was a little less... precise. So when I went looking for a map that I might be able to use to highlight some of the more relevant places in Helen of Sparta, the idea of using something a little bit more stylized appealed to me. I like the idea that it might have been closer to how Helen and Theseus viewed their world, rather than how WE might perceive Greece today! 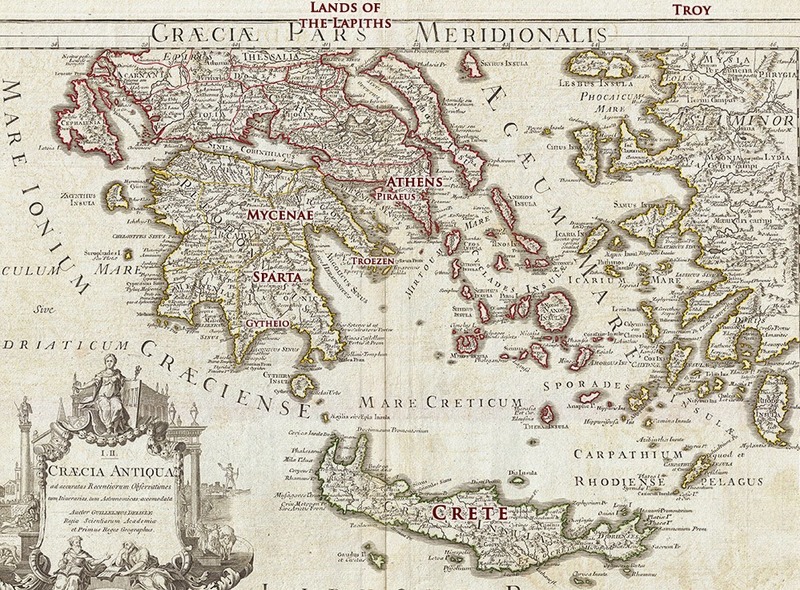 So for those of you looking for a better idea of the Geography as you read, here's a rough idea of where the cities of Mycenae, Athens, and Sparta were, in relation to one another, and the kingdom of Pirithous's people, the Lapiths, in the far north of Thessaly -- so far north, his home isn't even within the bounds of the map! This map was published in the 1700s, and drawn by a Guillaume Delisle. I just edited and cropped it a little bit in order to make the place names that mattered to my novel more apparent in the image. (Greece is crowded!) If you're curious, you can find the original image on wikimedia commons, along with a little bit more information about the map. 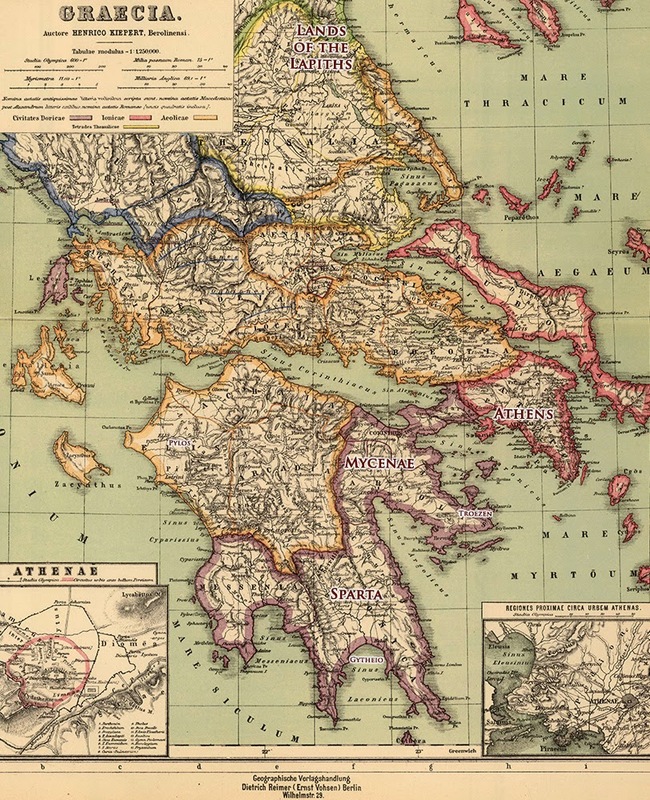 And if you'd like a bigger picture of Greece -- with Thessaly included, I also highlighted the relevant places on this 1903 map (slightly edited for size and readability by me, via Project Gutenberg and The Atlas of Ancient and Classical Geography by Samuel Butler.) You'll definitely want to click to embiggen and view it full size. 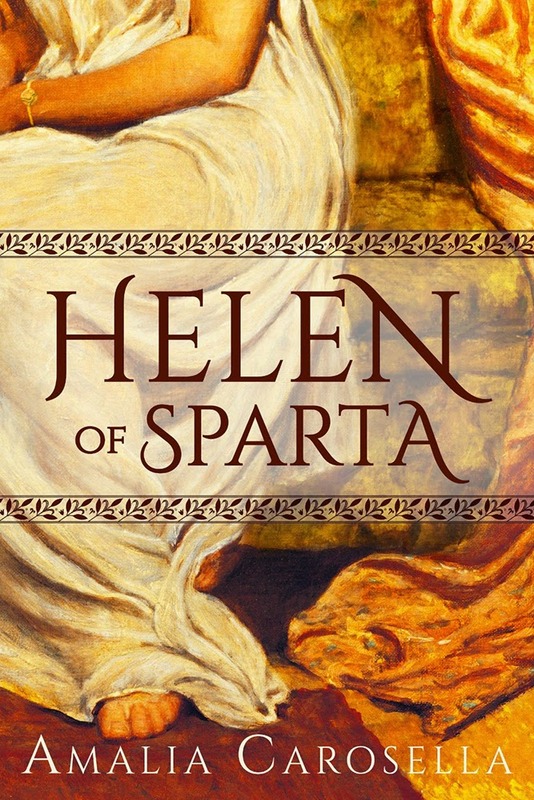 HELEN OF SPARTA blogtour begins April 1st!